Officially construction ended yesterday, as was contracted. In reality it will go on until March 31 as the contractor signed another deal, worth almost a billion rubles. Ever since the previous contractor was sacked in July of this year, it became apparent that the deadline of December 26 would be impossible to reach. Officially Metrostroi made it and handed Zenit Arena over yesterday, with both sides confirming that construction is now done. But, while roughly 97-99% is indeed done, Metrostroi was granted another contract in recent days (Dec 20) for “additional works” that will last until March 31, 2017. And it’s no small work either, the deal is valued at RUB 952 million ($15.6m). Officially ready, in reality the stadium will be under construction until early spring. The new contract represents 12% of what Metrostroi initially agreed to deliver the stadium for (7.7 billion). At this point it’s impossible to establish the final price tag for Zenit Arena as it’s subject to numerous lawsuits at this point. Current estimate from Vadim Tyulpanov, head of the Russian parliament upper house's interim commission on the organization of the 2018 World Cup, stands at RUB 41 billion (currently $672m). That’s roughly six times more than expected back in 2007. It seems the spring 2017 deadline for additional work is safe. Opening game is already scheduled for April 23, when Zenit will face Ural Yekaterinburg, another team waiting for their new stadium. After that date Zenit will play two more games in their new home before it’s handed over to FIFA for the 2017 Confederations Cup. It’s also possible that Russia’s largest ever hockey game will be played here as SKA Petersburg hope to break attendance record on a temporary ice rink. 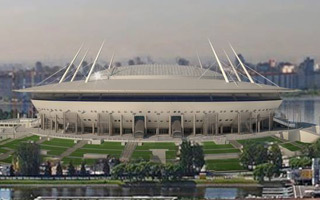 During the 2017 Confederations Cup the stadium will be the single most important of four venues. It will host both the opening (June 17, Russia vs. New Zealand), two other group games and the final of July 2. The building on the west side of Krestovskiy Ostrov island will also be among the most important hosts of Russia’s 2018 World Cup and Euro 2020.